Handmade News is published by Artfire and is the news of the handmade world or the crafts that are in that world. The News is broken down into numerous categories including craft techniques, business tips, marketing, kids crafts, inspiration and greenwise. I think the facility to read a Handmade 'Newspaper' is great, I have certainly learnt so much about setting up a business, marketing tips and so much more beyond that. Where else would I learn how to work with twitter, how to increase customer loyalty, how to make a DIY foot scrub or just have some daily inspiration. I had added excitement this weekend, I was checking the articles and see one of my cards as the lead image - one of MY cards!!!! 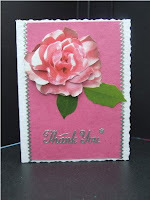 I must thank the wonderful Haffina Creations for thinking my little thank you card was suitable to use! Congratulations on your card being the 'lead image'. It's a beautiful card! !